Still image of CBS's "November 22nd and the Warren Report," September 27, 1964. Building on his first journalistic jobs writing newscasts and covering sports for KSAM Radio in Huntsville, Texas, as well as stringing for AP and UPI, Dan Rather worked at KTRH Radio in Houston from 1954 to 1960. There he wrote newscasts and broadcasts and was a beat reporter, covering city hall, the courts, and the police station. He also continued doing play-by-play sports, which led to his first television job with KTRK, doing a weekly “Coaches Show” for the University of Houston, before joining the CBS affiliate KHOU in 1960. In his new position he focused on breaking news and the weather, the bread and butter of local channels, leading to his national breakthrough in 1961 with his reporting during Hurricane Carla. Hired by CBS, Rather spent six weeks in New York before being sent back to the South in 1962 as chief of the Southwest bureau in Dallas and then, in August 1963, as chief of the Southern bureau in New Orleans. With Nelson Benton as bureau manager and Lew Wood as field reporter, Rather was responsible for covering news events in the South, Southwest, Mexico, and Central America. During that time, he occasionally contributed to CBS Reports and often reported on racial conflicts in the South and the fight for civil rights. These early reports helped increase and consolidate Dan Rather’s reputation as an up-and-coming investigative journalist. In November 13, 1963, for example, an ad in Variety listed him as part of Walter Cronkite’s Evening News team, next to Eric Sevareid, Charles Collingwood, Marvin Kalb, and Daniel Schorr, the reporters who would be his colleagues in New York. President Kennedy's assassination in November 1963 catapulted him to the national scene. 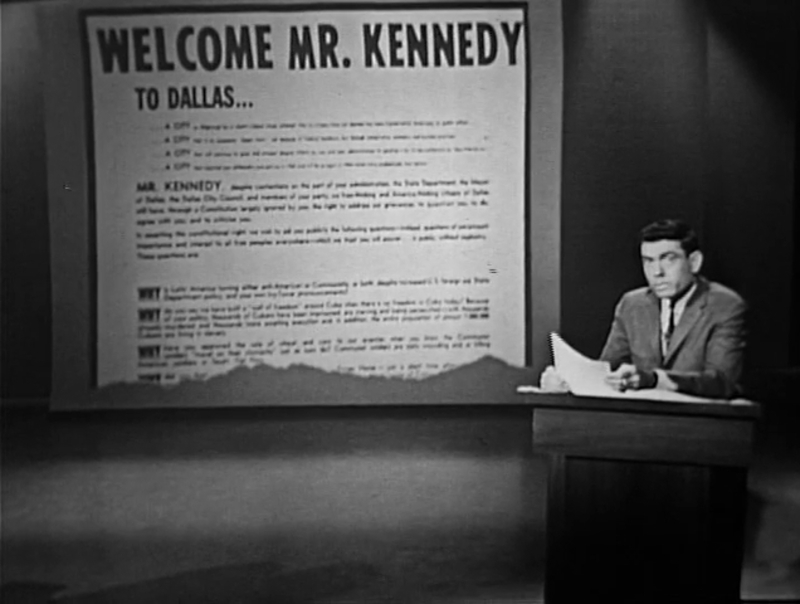 Dan Rather was part of a team of journalists covering President Kennedy’s visit to Dallas. He was on the ground when the shooting took place and was one of the first journalists to confirm the president’s death. One of only two journalists to see the Zapruder film in Dallas, Rather described it for the first time on television. In the following years, Dan Rather was part of the CBS team that reported extensively about the assassination, the legal implications of Lee Oswald's case and the Warren Report in a series of CBS News specials. Rather was later appointed White House correspondent from 1964 to 1974, and he also did extensive reporting across the globe during that time, including London, Greece, India, and China, as well as Vietnam, where he succeeded Morley Safer as chief Vietnam correspondent for CBS News.